There are many times that people point to America as an excuse for doing something. We should not use proxies. “America does it.” We do not need to spend so much on weapons. “America does it.” We should not interfere in other countries affairs. “America does it.” However last night we saw the Americans do something amazing. I am writing of course about the inquiry into Donald Trump and the testimony before the Congress by the ex-FBI Director James Comey. Now let us discuss what we saw. First, the former FBI chief who was fired by the President was ordered to testify and answer questions from both Republicans and Democrats. 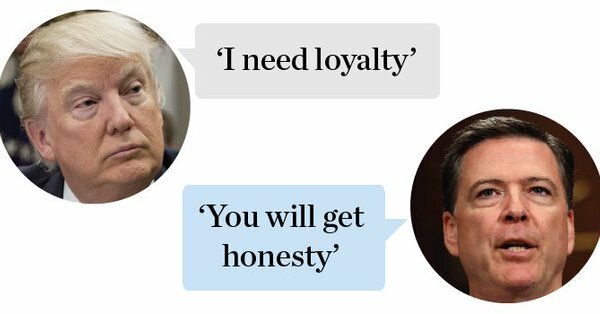 During his statement, James Comey termed the President and his aides as liars. No shouting broke out. No threats were made or disruptions took place. The entire event was calm and taken seriously. Next, the political leaders from each party both asked difficult but fair questions. When James Comey responded that he could not answer in public due to the sensitivity of the issue but he would answer behind closed doors, his reply was accepted. When he criticised the President, even the President’s own party members accepted his statements. The President’s party members did not attack him and term him as a traitor or a paid agent. Everyone involved in the inquiry appeared to have one thing in mind: Getting to the truth, whatever the truth might be. It also must be noted how we know all of this. The entire hearing which took place in the Halls of Congress was broadcast by all media and streamed online. Even the full video of the hearing posted above was provided by the New York Times which the President has attacked as ‘fake news’. However no attempt was made to hide the contents or the criticism. To say the entire world was watching would not be an exaggeration, and nobody could watch and think that it made President Trump look good. Now compare to how we have handled sensitive inquiries here. Panama Papers, Memogate, Dawn Leaks…each of these has been handled in the complete opposite manner. Public hearings have mostly been done by TV anchors pushing sensational narratives rather than calm and unbiased questioning by elected leaders. Political loyalties and personal biases have often been placed before the facts, even in cases of national security. And in the end, what has been uncovered by officials has been hidden from the public only feeding the confusion and conspiracies. There are many things that we should not copy from American politics and actions, and we should always make our own decisions what is based on the good of our own country first and last. In the case of how to handle an official investigation, though, this is one where we should be taking notes.